Spire.PDF for Silverlight is a PDF component that enables users to develop applications in Silverlight. With Spire.PDF for Silverlight, users can read, write and manipulate PDF documents without Adobe Acrobat. 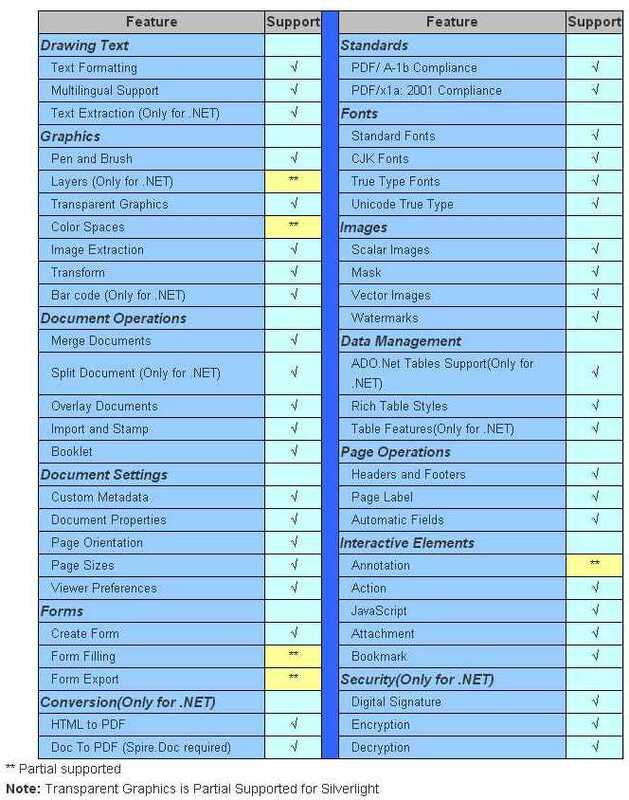 As a powerful Silverlight PDF component, it provides lots of featured functions. Spire.PDF for Silverlight supports standard PDF/ A-1b, PDF/X1a and even encrypted PDF documents. Users can use Spire.PDF for Silverlight to do most PDF document operations like merge PDF documents. Furthermore, this Silverlight PDF component can help setting PDF document properties. Spire.PDF for Silverlight is a standalone Silverlight component. It is independently and doesn’t need any other 3rd party software/library installed on system.